My parents bought a cash box for Adam and he loved it too!! But I like the idea of making them, like yours!! Such a great idea!! And having a teenage boy ... I totally agree ... they are IMPOSSIBLE to buy for!! LOL!!!!!! Great idea Cindy! I especially like that it's in a good sized box giving the recipient absolutely no clue as to what is inside! Funny that they thought it might explode! LOL! Another great idea, Cindy. Will remember this one for next year. They boxes turned out great! Cool, Mom! I am going to try that for my grandkids. Very clever! Great idea for teens!! Love it! We did that once for my nephew, but we didn't wrap it as cute. That definitely takes the gift up a notch, and the crisp new bills are a nice touch. Thanks for sharing!!! 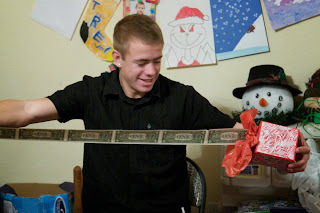 We also did the one where you stuff dollars in balloons and wrap 20 balloons in a BIG box. That was fun. What an awesome idea!!! One to remember! TFS! Did you use regular Scotch tape to tape the bills together? Yes. It takes a little effort to separate the bills, but after dozens of these, none of our recipients have had any tearing.